The corner of 10th Street and Piedmont Avernue in Atlanta was home to Outwrite Bookstore for more than 18 years serving as a symbol of strength and diversity in Midtown. Although it’s changed hands, the appropriately named 10th & Piedmont continues the tradition of being a destination for locals and visitors focused on Southern hospitality…but no longer a bookstore, it’s now a restaurant and cultural hot spot. Brothers Sean and Gilbert Yeremyan of Communitas Hospitality (who also operate HOBNOB Tavern and Gilbert’s in the same neighborhood) brought in Executive Chef Brett Ring who crafted a menu using multi-cultural flavors and organic ingredients to execute global cuisine with a regional, Southern influence. Pretty Southern caught up with Sean and Gilbert to chat about their new enterprise. Q: With already having Gilbert’s and HOBNOB in your portfolio, how is 10th & Piedmont different from your existing restaurants? What’s similar? 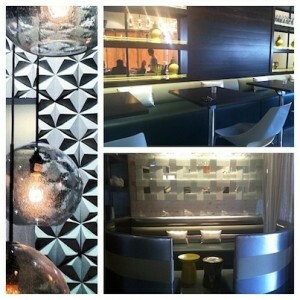 A; 10th & Piedmont is an extension of Gilbert’s, designed to make this corner a complete evening out destination. While the styles and menus of each restaurant are different, they are all similar in terms of friendly service and a commitment to excellence. Q: How did you determine the restaurant’s style? A: It was about knowing the neighborhood, respecting its needs, and knowing what they wanted. We held a focus group to get feedback and gain a deeper understanding of what the community desired. Q: Are there any tributes to Outwrite in the new space? A: Not physical tributes, but the spirit continues. We do commemorate Outwrite on our menus. We embraced the essence of Outwrite, their role as the center of the community, and continue their legacy, emphasizing diversity and flying a rainbow flag. Q: Are there any local vendors you call favorites for produce, meats, booze, etc.? A: My produce guy puts a lot of emphasis on working with local farmers. We also use Inland Seafood to ensure we serve sustainable products. Q: What are your favorite foodie features on the menu? 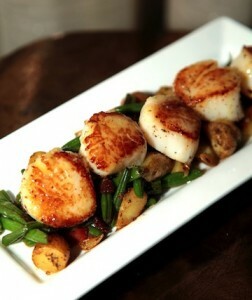 A: Sean: Definitely the Diver Scallops – you can share the dish or have it as an entrée for yourself. Gilbert: The Chicken and Waffles: it’s our innovative version of a classic dish. Q: Atlanta is truly making a name for itself in the culinary scene. Besides y’all – who are your other favorite players in the game? A: Buckhead Life. They are the leaders of food in this city. Q: What made you decide to get into the restaurant biz? A: Sean: The movie Cocktail with Tom Cruise. Once I saw that, I knew I wanted to study culinary arts to become a bartender and restaurateur. Q: What are your favorite memories of Atlanta? A: We have had so many good times at Piedmont Park. It’s just a block away from the restaurants, so it’s a great place to go relax. Q: What are your signature cocktails at 10th & Piedmont? A: Gilbert: The vodka selection, we are a vodka bar, and it’s very extensive. 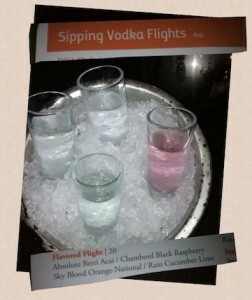 Sean: The vodka flight for sure. Q: Are you from the South originally? If not, where? A: No, we are from Northern Turkey, Istanbul. Q: What’s your greatest accomplishment? A: Sean: Certainly my kids. Q: How would you define a Southerner in the 21st century? A: Gilbert: Southerners are more open to new ideas and more aware of the world. They’re more adventurous with tastes and flavors. Q: What’s your definition of a lady? A: Sean: In Gregorian times, it meant a high status woman, someone who is above other girls. Gilbert: It’s a female with confidence and self-respect who knows how to act in different environments without putting anyone down. Q: How about a gentleman? A: Same as above, but a man. He has manners and is respectful to himself and others. Q: What’s the biggest piece of advice you can bestow? A: Enjoy new flavors and explore the culinary scene of Atlanta. Always remember to support local and read Pretty Southern! 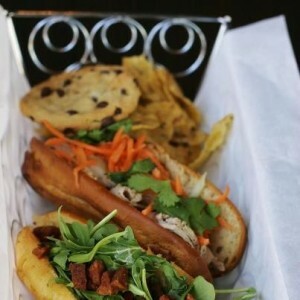 Daily Lunch combos for only $10 and y’all get tons of food including a Yum Bun, chips, dessert and drink! Individual Yum Buns are only $5. Bellini brunch is served on Sunday from 10 a.m. to 3 p.m. followed by a tea dance at 4 p.m. with Live Music Brunch starting at 11 a.m.
Live DJ entertainment is featured Friday through Sunday nights. 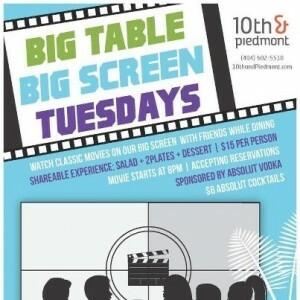 Big Table Big Screen Tuesdays start at 8 pm. For $15 per person you get a menu of Salad plus 2 Plates and Dessert. Since it’s sponsored by Absolut Vodka, select cocktails are only $6. 10th & Piedmont is located at 991 Piedmont Avenue. The restaurant serves dinner Monday – Wednesday from 5 p.m. to 10 p.m. and Thursday-Saturday from 5 p.m. to 11 p.m. Lunch is offered with counter service Monday – Friday from 11 a.m. to 4 p.m. and the dinner menu is offered with table service on Saturday from 11 a.m. to 4 p.m. A late night menu is offered once dinner service has ended and is served Monday-Saturday until 2 a.m. Editor’s Note – Thanks to 10th & Piedmont for the stellar photos. To see more, Like them on Facebook, follow them on Twitter, and check out their website, or call (404) 602-5510.